Are you suffering from emotional baggage, pain, chronic illness, or an autoimmune disease (a disorder like fibromyalgia, rheumatoid arthritis, or lupus which stops your body from healing itself)? If so, please listen to this audiobook - written just for you! How would you like to be able to heal yourself of day-to-day pain and emotional stress in your life when no one else can - not even your doctor? Most doctors do not know how to release stress and trauma, even though all doctors know these cause or contribute to most health problems. Ironically, some methods in the audiobook were created by doctors. How can this audiobook help you? Your author has discovered six energy-healing methods that have helped him and numerous others to turn their health around by lessening or eliminating stress and trauma. He created this audiobook to explain those unique energy-healing methods in order to educate those who have been unable to improve their health using traditional Western medicine. While he is not a doctor and makes no medical claims, he does possess certifications in several of the energy-balancing methods described in detail in this audiobook. He has used them to help hundreds of people get free (or mostly free) of pain and distress in minutes and has aided others over a longer period of time. User-friendly energy healing has helped millions - without drugs or invasive procedures. Even if you don't have major health issues, the energy-healing methods in this audiobook may well help you better maintain and/or improve your health. I'm required to include this disclaimer: "I was given this free review copy audio book at my request and have voluntarily left this review." Bearing NO influence on my rating and review is the author/narrator had communicated to my twice that if I did not leave a review, I would be reported to AudioBookBoom! and have my privileges revoked. Under threat or not, this was a very difficult book to get through. It's dry and boring and doesn't really 'start' until chapter 6, as an FYI. Yup. It took me 4 months to get through 3 1/2 hours. Because I tried - tried -tried to find good information in this. It does not bring me pleasure to trash a book that was written and delivered with the intent to help others. When I read the book description and listened to the sample, I thought - and hoped - this would be scientifically based and include facts; not just one or two personal experiences (his and his wife's). We can all admit there are times we want to know if there are simple steps we can take to feel or be better. We delve into new technology and knowledge to broaden our horizons and deepen our understandings of our bodies and thoughts. THIS. IS. NOT. ON. THAT. SAME. PLANE. This should be listed under the genres of sci-fi or fiction. We have all gone to doctors and heard their different advises and diagnoses. O'Dwyer starts this audiobook with a personal story about how ONE US doctor told him running was bad for his back .... Running is not ALWAYS bad for your back - many of us can vouch from personal experiences as well how some exercises and hobbies and can healthy and healing. If done in moderation and with proper warm up. Actually, before his US doctor told him running was bad for his bad, a doctor in Japan doctor told him running was okay for his back (sciatic nerve pains). It goes back to - how many times have different doctors prescribed different methods? In reference to the headline, O'Dwyer just doesn't insinuate, he flat out says that stress leads to diseases, including cancer. Trauma triggers disease. Trauma is defined as "a deeply distressing or disturbing experience" or a "physical injury". Okay, so EVERYONE is susceptible to diseases because we are human, live and breathe, and are aware that the world is not perfect, some of our relatives, friends, and co-workers will die in our life time, most people will have relationships that do not work out, and some of our plans in life will not pan out. "Life can be traumatic." Duh! Ok. Did someone tell him that life was fair and simple and full of roses? "When we have trouble coping with life, bad things, such as cancer, can happen." Ok, so listen up all therapists, case managers, psychiatrists, and psychologists, person who you are treating who are distressed over life's events are more prone to cancer. O'Dwyer's inability to maintain employment had prompted him to move to several different states. Wow. I think moving is stressful, within itself, so how much of this did he bring on himself? O'Dwyer is not a doctor nor has he a medical background. I strongly suggest anyway seeking relief from pain or disease to seek help from an educated, board certified, medically licensed professional. I'm not sure if the writer is affiliated with a religious cult who feels that positive thoughts and prayer will heal what ails you. I've seen many news articles about young parents who are now serving time because they did not trust a doctor with their infants are were charged with neglect and murder, and wonder if this is in a concentric circle of this concept. The only part I liked was about chakra energy, which I learned about when I was in middle school. I think the last half of Chapter 9 mentioned this. That's my review, I'm sticking to it. And I'm returning this book. There are some good ideas in this book.Most just seem wacko to me.I found John O'Dwyers narration rather stilted and boring.I was given this book by the narrator,author or publisher free for an honest review. This book has some interesting information based on many ancient ideas of energy. I am always interested in energy and more eastern ideas of energy flow, balance, etc. However, I have to say, there were a lot of comments that were simply repeated over and over again about the names of said techniques and stories repeated about personal antidotes. But, the amount of time actually spent on explanations or procedure where very quick or simply referred to other books. So, it left more a collection of personal experiences mostly, some of which were repeated. Very short on methods but perhaps would direct one to look into them more deeply. Some good take aways but the narration felt stilted and dry. Not a lot of emotion. Lots of repeating info that I could've done without. This was an informative and helpful audio. The author packs a lot of valuable information in almost 3 and a half hours. I let stress control my life, with motherhood, school, marriage, and home responsibilities I feel overwhelmed a lot of the time but this audio helped me with some coping methods and helpful information on how to release stress and live my best life. As a student of life and alternatives to accepted methods, I found this book interesting in what it offers as alternatives. Like the fact that the author narrated the book. If you are interested in alternative methods of healing this is a book for you. 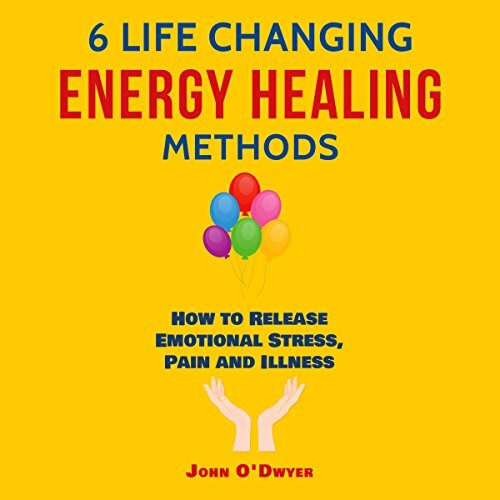 The 6 Life Changing Energy Healing Methods, presents a volume of information that claims to improve your health. While reading the book it give references you can look up to confirm or make-up your own mind on the methods described. John O’Dwyer has presented us with anecdotes and information on a variety of alternative healing methods. I was not familiar with many of the techniques mentioned, and I thought this was a good introduction to the alternative methods that are available. This was a good book when it comes to alternatives to medicine in the sense of people taking meds for every little ailment. For someone that suffers from both Multiple sclerosis and Crohns disease both of which are incurable I find the techniques to relieve pain and emotional distress helpful but I would not forgo medication for my illnesses. That being said meditation has helped me to focus and let go of pain and stress and so I do believe in the power of energy healing and look forward to using what I have learned in this book. A way to heal the mind and body without medication. I really appreciated all the information and techniques given in this audiobook. Sometimes when thinking of illness you could automatically think of going to the doctor and being prescribed medication or treatment that may not work. I have people in my family right that could been benefit from this information. I will recommend this book.